Have you ever stopped to watch the birds outside your windows? Did you know that there are over 900 bird species in North America? With so many species of birds throughout the country, do you ever wonder how we log and keep track of each and every type? 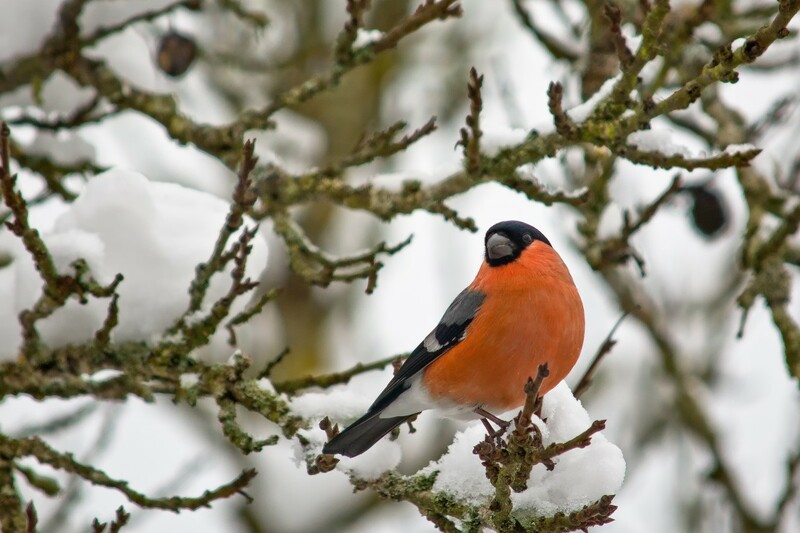 One method is the annual Christmas Bird Count, which is currently on its 119th annual cycle. The Christmas Bird Count (CBC) is a citizen-run science project tradition that has been going on for decades. Below, Ranger Mac will take a closer look at just how it works! Before the 20th century, hunters would go out on what was known as a holiday bird hunt, also called the Christmas 'side hunt.' The hunters would choose sides and go seek out birds with their guns. Whichever side brought in the biggest pile of feathered and furry finds won the hunt. At this time, conservation was in its early stages, and many observers and scientists were becoming concerned with the declining bird populations. Frank M. Chapman, ornithologist and an early officer of the Audubon Society, proposed a new holiday tradition on Christmas Day, 1900. This new tradition was called the “Christmas Bird Census.” The project urged people to count birds during the holidays rather than hunt them. This census eventually turned into what is now known as the Christmas Bird Count. On that first bird count, there were 27 dedicated birders, 25 Christmas Bird Counts held, and the locations ranged from Ontario, Canada to Pacific Grove, California. Those 27 original Christmas Bird Counters tallied around 90 species on all the counts combined. Starting in November each year, any birders who are interested in participating in the Christmas Bird Count can sign up through the Audubon website. From December 14 to January 5 each year, there are tens of thousands of volunteers throughout America who brave the elements to take part in the effort of counting birds for conservation. Audubon and other organizations will then take that data and use it in a long-running wildlife census to help assess the health of bird populations and to help guide others in conservation action. The data that volunteers help collect allows the Audubon researchers as well as conservation biologists to study the long-term health and status of bird populations across North America. When it’s combined with other data from other surveys, it helps provide a bigger picture of how the continent’s bird populations have changed over time as well as space over the last 100 years. In 2007, the CBC data helped in the development of Audubon's Common Birds in Decline Report. This report revealed that the populations of some of America's most beloved and familiar birds have taken a nosedive over the past 40 years. In 2009, CBC data was instrumental in the collaborative report by the North American Bird Conservation Initiative and the U.S. Fish and Wildlife Service. The Environmental Protection Agency, or EPA, included the Audubon's work from CBC data as one of the 26 indicators of climate change in its 2012 report. The 2014 Climate Change Report from Audubon predicted how climate change could affect the ranges of 588 North American birds. Of the 588 species that the Audubon studied, it showed that more than half are in trouble. The models all indicate that 314 species will lose more than 50 percent of their current climatic range by the year 2080. These CBC numbers provide valuable data each year for conservationists and researchers to use to assess trends. One example of a bird that found help through this count was with the bald eagle. The Christmas Bird Count was important in helping track the bald eagle population rebound after almost being driven into extinction by hunters and pesticides in the mid-20th century. Each year, the National Audubon Society sponsors more than 2,400 local events for the Christmas Bird Count. A volunteer group will spend one day searching a circular area of 15 miles in diameter to help identify and record as many birds as possible. The Audubon researchers and conservationists will then take and compile the data from all participants to assess bird populations. The Christmas Bird Count continues to thrive today! You can check out the results of the 118th bird count (from 2017-2018) here. Keep an eye out for the results of the 119th annual bird count early in 2019. With conservation being at the forefront of scientific research, there’s no better time than right now to go to the Audubon website and sign up to help in the observation of birds. Taking one day to record what you find as you seek out birds and enjoy nature is a small but effective way that you can help as we all work towards better conservation habits. Who knew that counting birds could help in so many ways to preserve and better understand our planet? If you want more information on wildlife conservation, check out Ranger Mac’s blog here!